Bianca Del Rio is the quick witted insult comic drag queen who won season 6 of my favourite TV show, Rupaul’s Drag Race. 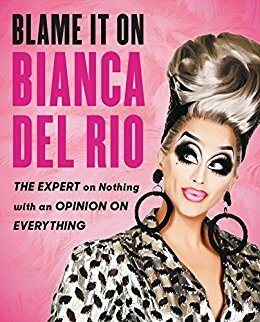 Even though she isn’t my favourite queen to come from the show when I heard she was bringing out a book responding to advice questions I knew I’d have to give it a read. If you loved her on the show I’d highly recommend giving this a read. I’d say it’s a perfect, hilarious read for summer especially if you’re going away and want something to read around the pool with a cocktail. As there isn’t a plot and it’s just responses to questions you can pick it up and whiz through a couple of letters whenever you have a spare few minutes. Not every joke lands and some topics she takes a little too far for my liking but she is known for pushing the limit as far as she possibly can so you wouldn’t really go into this expecting her to respond with hearts and hugs. There’s also really strong language used throughout which doesn’t offend me but if it’s something you’re not keen on I’d give it a miss. Previous Post I’m Not Trying? I’ve actually never even heard of her… BUT she sounds like my type of gal lol Since this is tagged under audiobook, I assumed you listened to it… Does she narrate it herself?